The front hall of the Wadsworth-Longfellow House, 2002. 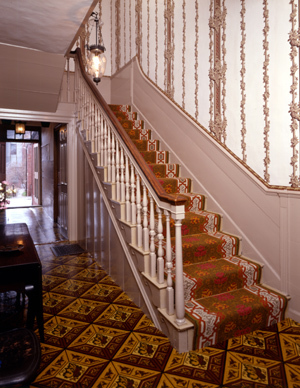 In the front hall, the walls retain their original eighteenth-century wainscot paneling: the upper plaster wall was decorated with wallpaper beginning in 1786. Influential American architect Alexander Jackson Downing suggested new styles and decoration of residences in The Architecture of Country Houses (1850). The hall's costly French rococo-revival paper, featuring large cartouches, illustrates "the enhanced architectural effect which may be given a plain room, by covering the walls with paper of a suitable style." The rococo-revival paper Henry Wadsworth Longfellow and his wife Fanny selected in 1844 for the parlor at Craigie House, their Cambridge home, may have inspired Anne Longfellow Pierce's choice. Anne's design was particularly sophisticated with the use of two alternating rolls. Borders representing architectural molding and leaves at the ceiling and wainscot further defined the room.